Hello friends! 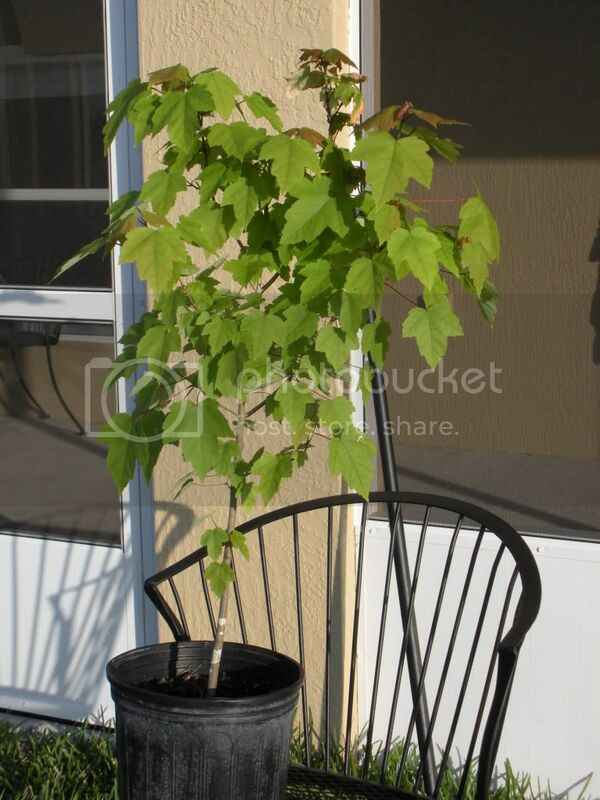 I'm new to gardening and I just bought a beautiful red maple tree to put in my back yard. I noticed the second day after I brought it home that some of the smaller leaves had started to dry up and turn brown around the edges. I hadn't watered it that day so since then, I check the soil every day and water if it's dry. Now, the bigger leaves are starting to get some holes in them. I've attached some pics as evidence! It's funny that I'm so attached to this little tree already! L Please help me figure out what's happening so I can make adjustments accordingly! I don't want to lose my first tree in the first week! It also has this stuff on the trunk...and ideas what this is and if it's okay? I notice you're in florida, and I assume you're keeping the tree in full sun which could be the problem. From one of your pictures it seems like the tree has a majority of "shade leaves". Leaves which are large and broad, rather then "sun leaves", small and many. If the tree was germinated and grown in shade/part shade, the sudden exposure to full sun could be damaging the leaves by burning them. 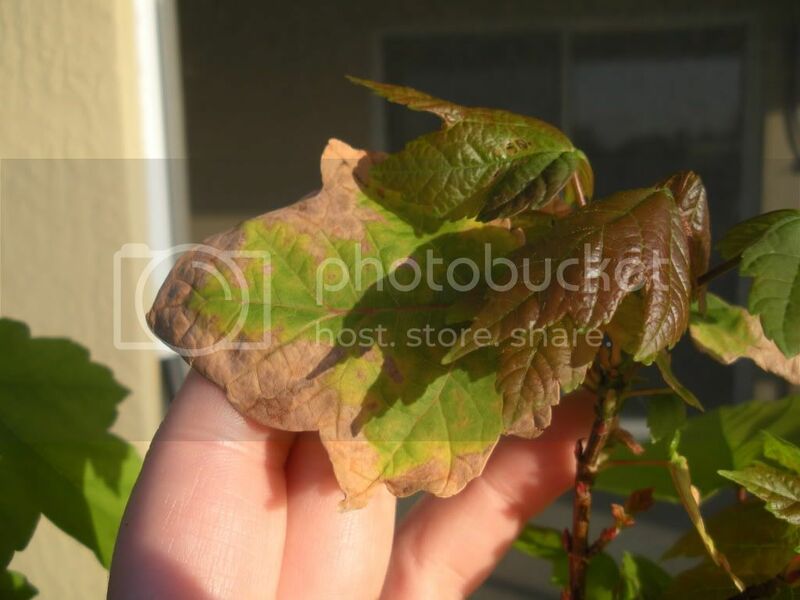 The newer under-developed leaves would be easily damaged. I would try moving the tree to an area where it is more shady, as well as moving it away from the wall of your house. The heat radiated from the stone could also be causing problems. Then also the pot in which the tree is in could be too small for the trees roots, the energy being absorbed by the black pot under your floridian sun could also be roasting your trees roots. as well as quickly drying out the soil, damaging the fine root hairs. The lessened water uptake could be damaging the upper leaves as well, since the water would cool them off and prevent scortching. 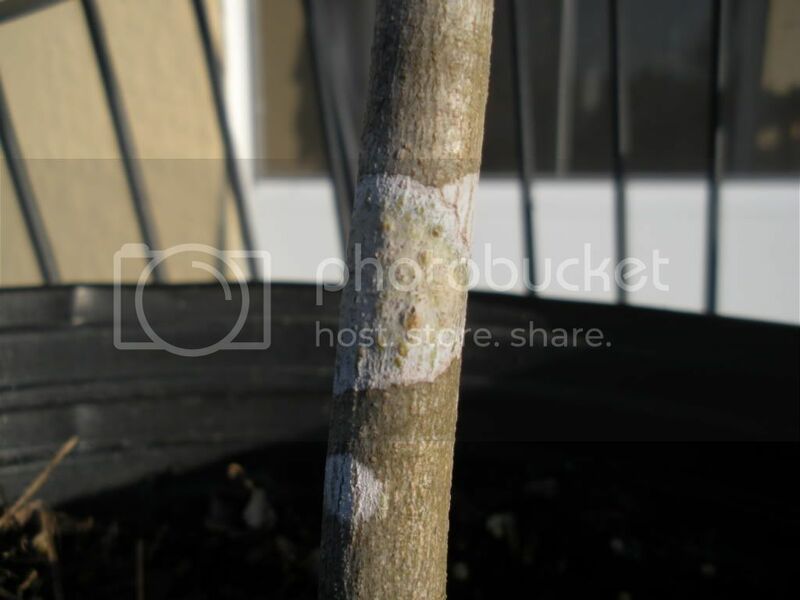 I would suggest getting a larger pot for your tree, in a lighter color, this would prevent the pot getting very hot, as well as help retain water in the soil. (Or plant the tree in the area you want to have it, and keep it watered) Then also move your tree to a spot with part sun until it develops its "sun leaves", and is more adapted to the intense sunlight. As for that fungus/lichen, there are alot of possibilities, most lichens don't affect the trees ability to function. Thanks so much for the input! The place that I want to plant it is in full sun...If I plant it, will it be able to adapt? I know the pot is too small - - I want to plant it asap. I just got it last Tuesday and that's the pot they had it in. The roots are already poking out of the drainage holes. Should I put it right in the ground or a bigger pot in partial shade? I'd like to get it in the ground as soon as possible so it will establish well in its permanent location. It gets full sun and it's a little windy at times. I know that wind exposure will strengthen the cells so that's a concern of mine as well. Whadda ya think? Well, I would put it in the ground, but make sure you keep it watered. Full sun and wind will quickly dry a plant out, if the plant came with instructions for planting, I would follow them, if it didn't you could call up the local garden nursery and ask them the best way to plant a red maple, since soil types vary, and I'm not sure what you would have to do to ammend the soil in florida. If you're going to have the plant out of the ground much longer, I would suggest getting a larger pot, at the moment it seems the pot you have it in is a 1 gallon pot, with dirt not filled up entirely either, which is definatly too small. As for your tree adapting, it will eventually if it has the vigor to do so, red maples grow everywhere on the eastern part of the U.S.. Just keep it well watered so it doesnt dry out and it should be fine. And just to be sure you may want to bring in that picture of the fungus/lichen to the garden nursery as well, just to see if they might know anything about it, but things like that are very hard to identify, and in some cases you need special equipment in a lab just to tell species apart from one another. Oh, and I would also wait for a second opinion, either here, or from your garden nursery. Thanks again for your help! I will call my loval nursery and see if they have any helpful hints. I can't wait to get it in the ground and see how it does. It was only $9 for the tree, so in my head I keep telling myself that if it dies I can just get something else, but I love it so much already! Anyway...thanks for the help! Maples in Florida ????????????????????? I hate raining on some ones parade but maples need a wintering dormancy. Im not sure how long your tree will last even if you find the perfect location. Maybe i am wrong about the specific varity you have but pretty certain your tree will not survive. Apologies for being blunt and for your sake as i see you are excited about your tree. I hope iam worng here. According to the linked source below, red maple will grow throughout Florida with the only exception being the everglades area. Thanks for your input, everyone! I did plant it and it looks BEAUTIFUL! Now...what are the odds of it growing in soil that has lots of clay? It's mostly clay with some sand thrown in there. Not the best, I know. Any ideas for helping the soil? Thanks again for all of your help! 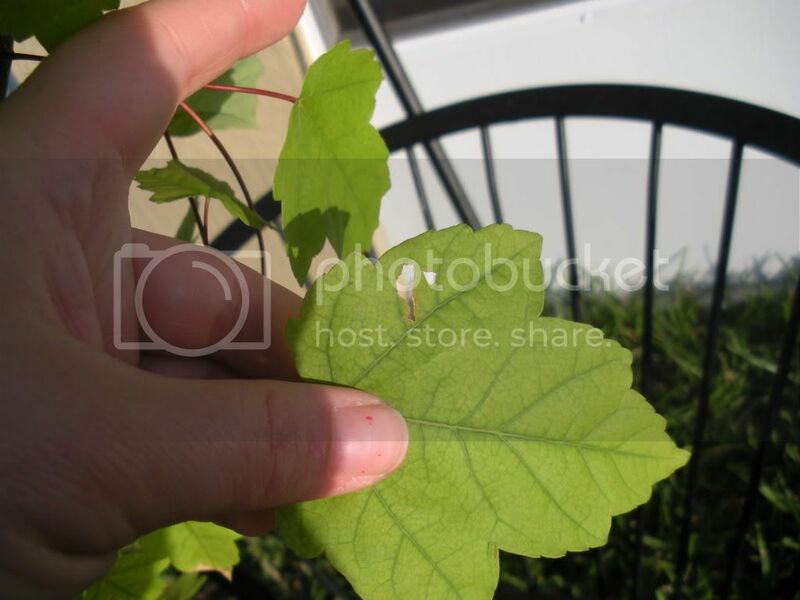 Give a maple adequate water for the first couple of seasons and it WILL grow. The trees have very aggressive roots so keep that in mind when selecting a site. A maple is not the kind of tree that needs any special pampering. Ugh! I hate my soil! I watered it yesterday and this morning when I went out, it's all limp at the top! I don't know how to get the water to soak down and get to the roots. (clay is not my friend) Any suggestions? Take a piece of pvc, drill a few holes in the bottom half and then bury the pipe in the ground close to the tree. Pour water in the PVC and it will slowly seep out near the tree roots. Also, I'm not sure the condition of your tree's root ball, but in many cases it is a good idea to prune a transplant back by about 1/3 of the top growth. I love the PVC pipe idea...the pruning makes me nervous...just start cutting stuff off? I guess that's part of the process, isn't it? Who knew there were so many life lessons in gardening! LOL How do I know what to cut? Any rhyme or reason? Or just start hacking away! I did a quick google and it appears that maples should not be pruned in the spring as they lose too much fluid through the fresh cuts. Hopefully, your tree will perk up when the roots get some water. Clearly it is in distress with the wilting top, so better get some water to the roots soon, if that is what is causing the problem. My maple doesn't look so good. I think I've overwatered. I had heard that you want to keep it well watered when you first plant it, so I watered it 2 days in a row. Then, I did some research and learned that the easiest way to kill a plant in clay is to overwater. *sigh* I've not watered it in 3 days and I just went out and dug down 2 inches - still wet. I'm not going to water it again until the soil needs it. How will I know when my little friend turns a corner? Is it still possible? I hope that maples are forgiving and that I haven't killed my first tree. Any words of wisdom or encouragement? 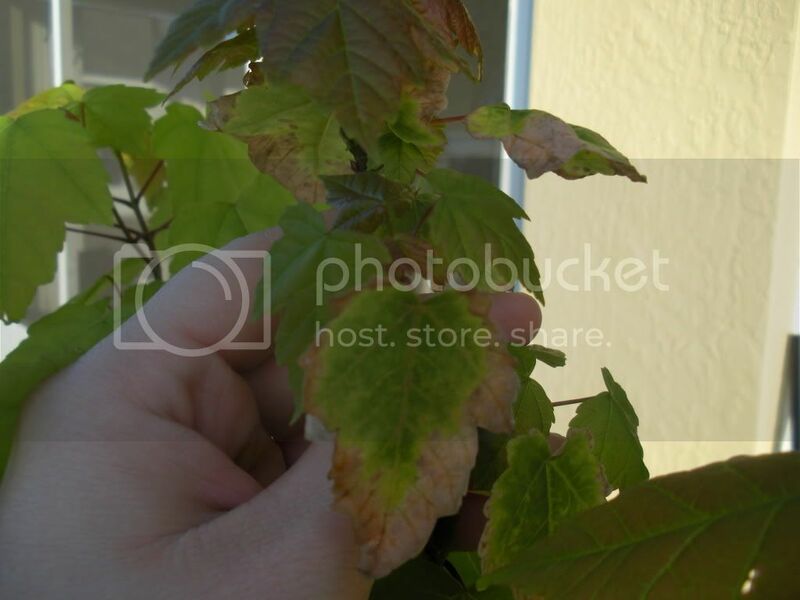 Autumn Blaze Maple Shriveled & Brown - Is it Dying?